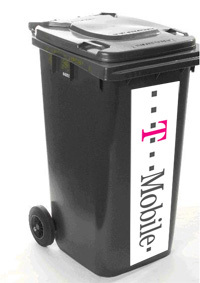 After filing our complaint a few days, ago, we finally received a response from T- Mobile. Feedback from other readers here and web reports already had our expectations running low, and they did indeed confirm that as loyal customers of 10 years standing, we could expect no discount at all on an upgrade to the G1 phone. Worse than that, they insisted that our decade’s worth of loyalty would be rewarded with an additional charge of £305, while a brand new customer could pick up the same phone – on exactly the same contract – for absolutely nothing. How crazy is that? The T-Mobile rep we spoke to certainly seemed to empathise with our position: reading between the lines he was well fed up having to tell long-paying customers that they’re going to be royally shafted by his company (he actually started the call saying that it ‘wasn’t a call he’d been looking forward to making’). During our chat, we suggested that we wouldn’t be the only customers to leave the network over their ludicrous intransigence, and the T-Mobile guy seemed to acknowledge that there had been a lot of people leaving over this policy change, and that the company “might have to review the situation” if this trend continued. 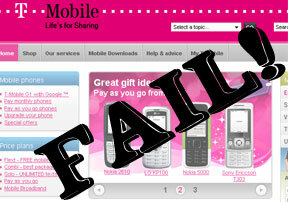 With no prospect of any discount on the horizon – and being in the bizarre situation of effectively being ‘fined’ for over a decade’s loyalty – we’ve elected to leave T Mobile. Switching networks involves requesting your PACT number – which the network provider has to give – and once you have this number, you have 30 days to move networks and keep your same mobile number (after this time, you have to request the number again). Ridiculously, there’s absolutely nothing to stop us leaving our new network provider in a month’s time, getting a new PACT number and then signing up for T Mobile’s more attractive new customer deal for the G1. At the end of all that, we’d still have original mobile number, and nothing would have changed apart from T-Mobile losing a month’s money and a shedload of goodwill in the process. Great PR work, guys! We’re so naffed off with T-Mobile that we’re going to switch networks for a rolling monthly contract immediately and then consider our options in a month or so.